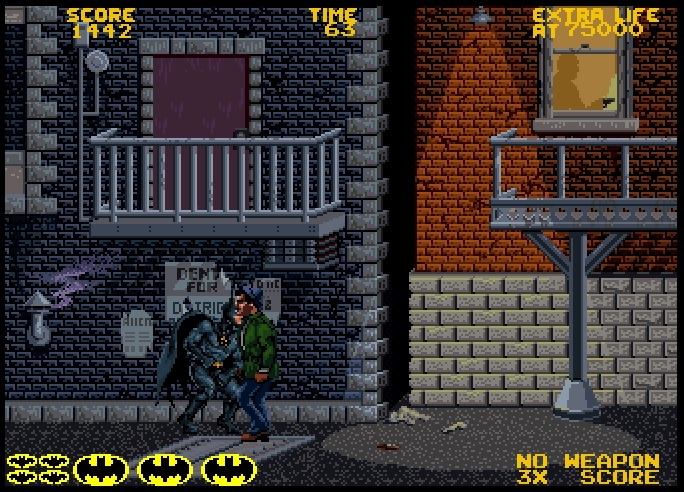 Batman's arcade adventure in 1990 by Atari used the likenesses and voices of film series stars Michael Keaton and Jack Nicholson, as well as Danny Elfman's score. The conventional wisdom is that Batman fell prey to the same fate of early superhero video games, with the exception of the Ninja Turtles: He just wasn't in anything good. That belief is misguided. The Dark Knight appeared in several video games in the late 1980s and early 1990s - including an inspired title on the Nintendo Entertainment System that gave the caped crusader some unconventional mobility. Data East and Atari joined forces for a 1990 arcade beat-em-up that featured the voices of both Michael Keaton and Jack Nicholson, who appeared together in the Tim Burton-directed film a year prior. You can play that game, without having to empty your change of pockets, by clicking on the image below! Click here to play Batman (1990) for free in your browser! Some enterprising soul has listed the default controls for the game on your keyboard: CTRL attacks, ALT jumps, and hit the 5, 6 or 7 keys to add credits. You have the choice of selecting 7 or 3 lives at the game's start, and you'll work your way through several levels that trace the narrative arc of the 1989 movie. The formula of a Batman beat 'em up has been replicated several times, both in the early 1990s and more recently with Batman: The Brave and the Bold and The Rise of Sin Tzu. When the film series was rebooted by Christopher Nolan in 2005 with Batman Begins, it launched with a video game adaptation that melded hand-to-hand combat and platforming. Instead of a video game version of The Dark Knight, however, Warner Bros. handed the reigns over to developer Rocksteady, who produced Arkham Asylum. The rest, as they say, is history. What's your favorite Batman video game? I've been playing Telltale's series, which takes some pretty big risks with the source material early on. Let us know in the comments below, and check back soon for another free game.